Since the start of the new millennium, we have witnessed the rise (and in some cases fall) of six Windows operating systems, six service packs and three significant "point one" upgrades. Now, one year on from the release of Windows 8.1, the launch of Windows 10 is set to redefine the OS market once again. Throughout this evolution, the 10-year shelf life that defined operating systems such as Windows XP has quickly become a thing of the past. With an increasing pace of change, there has been ever less time for operating systems to infiltrate and impact the wider market in any meaningful way. While we all witnessed the 10-year influence of Windows XP, can we justifiably say what the role of 8.1 has been in its meagre 13-month existence? To us, every operating system has come to play its own little part in a much broader evolution. Working on application rationalisation and portfolio management we have witnessed first hand the role that these operating systems have played within the IT and business sector – some far more so than others. When it came to the end of XP, the number one operating system that businesses were looking to adopt was Windows 7. Offering a shift from the well-publicised mistakes of Windows Vista, 7 encouraged improved productivity through ease of use, along with enhanced performance, security and virtual hard disk support. While Windows 7 remains the most popular replacement for XP, it was not without it's faults. As is often the case with OS migrations, some software applications are no longer supported on the new platform. In the case of Windows 7 this lack of support proved a particular issue, with many organisations losing the use of customised programs and bespoke databases. While the inclusion of a virtual sandbox helped to overcome this issue for small businesses, large organisations with unmanaged application portfolios suffered significant costs from the switch. In terms of its wider impact upon the market, one of the most vital changes brought by 7 was a renewed focus on application security. 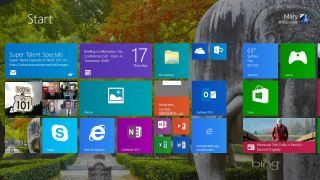 Learning from Vista's over-reliance on UAC security prompts, Microsoft succeeded in building a new operating system that alerted users to potential security risks on a non-invasive app-by-app basis. This system not only improved individual knowledge of application security, but also helped kick-start the view that system control should be decentralised away from the IT department and back to the individual user. Three years after the launch of Windows 7, Microsoft unveiled its new operating system, Windows 8. A mere twelve months later this was updated once again (some might say 'rolled back') to 8.1. While not the most popular OS, 8.1 did provide a vital stepping-stone and a key influence in the future direction of the OS marketplace. In terms of application management, 8.1 represented an open acknowledgement of the importance of multi-platform support; attempting to harmonise applications across desktops, laptops, tablets and mobiles. Additionally, Windows 8.1 also encouraged the mainstream usage of Cloud computing. By adding tighter integration with OneDrive and permanently linking applications to the user's Microsoft account, Windows 8.1 helped to acclimatise users to working in the Cloud. In both of these cases, 8.1 was used to encourage a sharp learning curve across the market. Through the inclusion of multi-platform apps and in-built cloud storage facilities the OS boldly forced these concepts upon its users, proving that Microsoft is no longer willing to wait 10 years for customers to adapt. This is the truly defining aspect of both Windows 7 and Windows 8.1. As the OS product life cycle shortens, OS developers can no longer wait for their customers to catch up. Unlike the simple software upgrades that preceded them, broad concepts such as mobile and Cloud computing are providing an essential infrastructure upon which the next generation of operating systems will be built. This was the great success of Windows 7 and 8 - that they laid the foundations for the next generation of mobile operating systems. By building awareness within the public mind they readied us for Cloud computing, remote storage, portable applications, and multi-platform use. It is these systems that will represent the future of the OS marketplace. How? Only Windows 10 will tell.